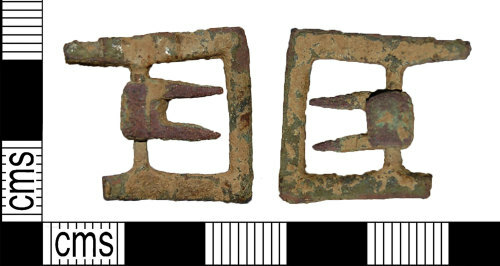 An incomplete cast copper-alloy buckle frame, probably a double loop asymmetrical buckle dating to the Post-Medieval period (c. AD 1575-1700). The frame comprises a flat rectangular sectioned and shaped loop and a narrowed strap bar. Only part of the opposite side of the frame survives. The two pins are pointed and attach to a rectangular plate bent around the strap bar. The underside of the frame is flat. The buckle frame measures 21mm in length, 20mm in width and 4.5mm thick. The pins are 11.5mm in length including the attachment plate. The buckle frame weighs 2.5 grams. See Whitehead 1996, p. 92, no. 581 for a similar example with a single pin.